Enamel is the mineral layer which covers the outside of the crown of the tooth and is the hardest substance in the human body. Despite enamel being so strong, teeth are still at risk of breaking. Decay – risk factors which can lead to cavities in teeth include having lots of sugary foods and drinks in combination with plaque build-up. When sugar is consumed, an acid is formed which, over time, causes tooth enamel to soften and spread to the dentine underneath, causing a hole to develop. To reduce the risk of decay, you must reduce sugary foods and drinks, especially as snacks in between meals. Maintain a high standard of oral hygiene, involving brushing twice a day with a fluoridated toothpaste and flossing once a day. Visit your dentist and hygienist regularly to have your teeth checked and cleaned. Your dentist may recommend specific products to help strengthen your enamel, such as fluoride mouthwash or Tooth Mousse. Ultimately, once tooth enamel has been lost, the damage is irreversible. So, in order to maintain a healthy smile for life, visit your dentist regularly, eat a healthy diet and practice optimal home dental hygiene and care. 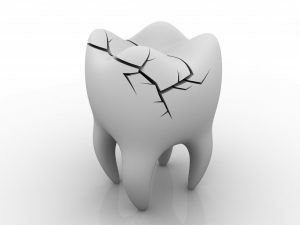 The post If enamel is the hardest substance in the body, why do teeth break? appeared first on Smile Solutions.